We did it! When My Belly is Mine was formed at the very beginning of this year, our objective was to stop the Spanish antiabortion draft bill proposed by the conservative Popular Party (also known as the People’s Party) from being presented in parliament. If enacted, this reform would have taken Spain back 30 years in terms of reproductive rights. We worked hard to raise awareness of this threat. We echoed the major demos in Spain, alongside other protesters in European capitals and in cities across the world. Indeed, we were just one of the many many voices in Spain and abroad that clamoured against the bill. The Spanish press finally reported this weekend that the proposed abortion reform has been shelved due to a lack of consensus within the party. Congratulations and thanks to every single person who took to the streets and shouted out against the bill! We won! 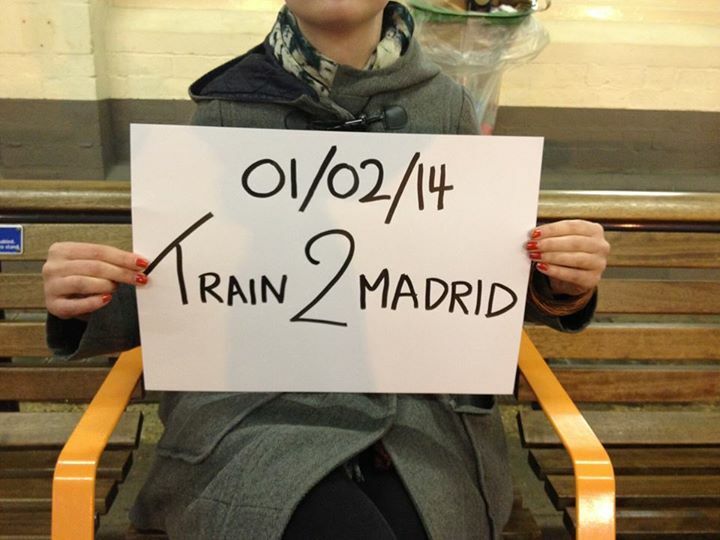 The Freedom Train protests in Madrid on the 1 Feb. My Belly is Mine echoed this protest in London. As reported on this blog, the Spanish Justice Minister Gallardón was the main force behind this regressive bill, which was to be known unofficially as Gallardón’s Law. Gallardón repeatedly claimed to have Prime Minister Rajoy’s total support for the bill. It was no surprise that the political left in Spain came together to vehemently oppose the draft bill, yet it would be his own party and Rajoy that would bring about the Justice Minister’s undoing. Privately Gallardón garnered support from party members yet in public few supported him. The regional leader José Antonio Monago was the first to criticise the bill by stating “nobody can force motherhood upon a woman”. As protests mounted and the unpopularity of the bill became evident, other regional leaders began to fear for their own political careers. Gallardón continued to defend his reform as he became increasingly isolated within his own political party. Throughout the summer, the presentation of the bill in parliament was continually postponed. Gallardón talked of busy schedules and conflicting agendas. The Spanish press, however, surmised the bill was being stalled behind the scenes. Protests continued, maintaining the pressure. My Belly is Mine organised an intense summer campaign in conjunction with Speaking of I.M.E.L.D.A and the 15M Spanish Women’s Assembly: we protested on two occasions outside the Spanish Embassy, once in the London Underground and once outside City Hall. The Spanish Women’s Assembly at a recent joint protest. The American author and activist Alice Walker said that activism was the rent she paid for living on the planet. Going to a protest, taking a banner, signing a petition, shouting out…this does all make a difference: always make your voice heard! “No insult will deter me from my commitment to protect the rights of the unborn”, Spanish Justice Minister Alberto Ruíz-Gallardón defiantly stated in February this year. This statement came two months after the Spanish Government announced its proposal to amend the country’s current abortion law in order to implement an almost blanket ban on pregnancy terminations. Despite continual protests against the bill organized by feminist and prochoice organizations in major Spanish cities and towns, manifestos defending a woman’s right to choose, condemnation by human rights organizations such as Amnesty International, and surveys expressing the Spanish population’s unhappiness with the proposed antiabortion law, Gallardón remained steadfast in his determination to pass the regressive draft bill. 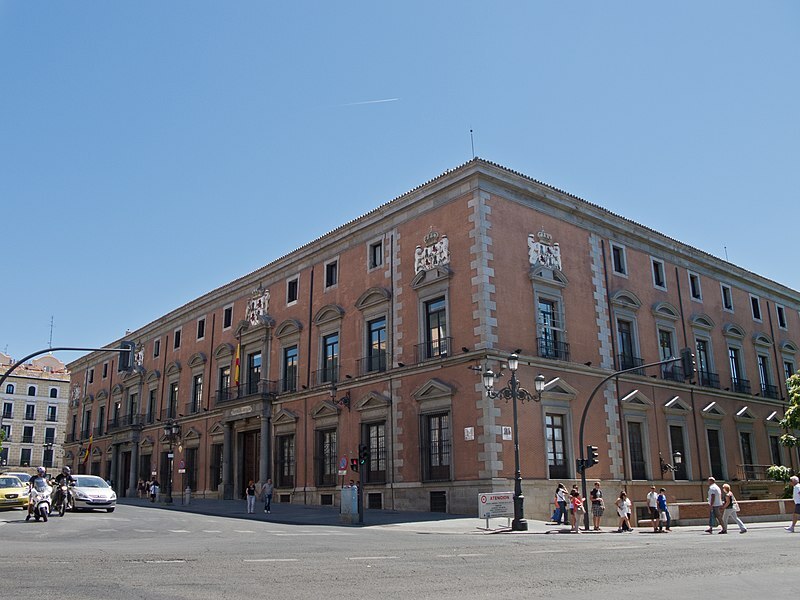 However, as reported on this blog, the Spanish Cabinet has had at least four clear opportunities to present the bill in parliament for debate and voting. On these four occasions (the 25th of June, the 1st and 8th of July and the 1st of August) the bill was conspicuous by its absence in Cabinet meetings. Gallardón claimed the delay was caused by the Presidency and Vice-presidency’s office, which is responsible for setting the Cabinet’s agenda. Spanish media, on the other hand, speculated members within Gallardón’s own party, the conservative ruling People’s Party (Partido Popular), were stalling the bill due to an unwillingness to endanger their own political careers on such controversial legislation. The Spanish Government’s next Cabinet meeting is Friday 29th of August, the first after the summer recess. Political analysts explain that the bill must be passed on this date or early September to avoid it coinciding with the Popular Party‘s electoral campaign in the upcoming autonomic and municipal elections in May 2015. Otherwise the bill will most definitely be postponed until the general election in November 2015. 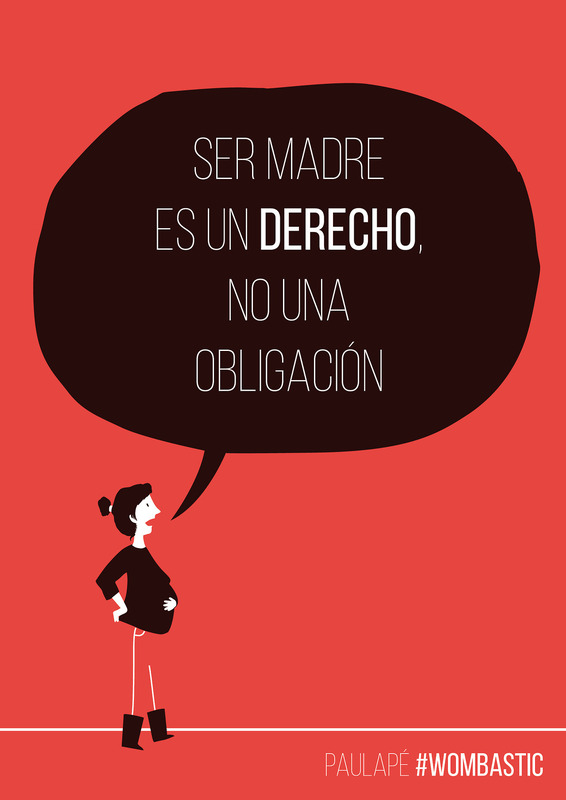 Women in Spain, feminist and prochoice organizations remain hopeful yet vigilant. 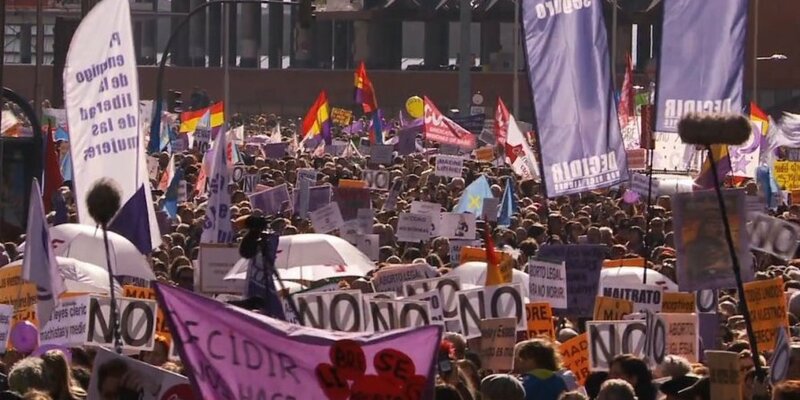 The Madrid Feminist Assembly stated it was tired of the Government toying with the rights of women and has organised a national protest for the 28th of September, the global day for action for access to safe and legal abortion. My Belly is Mine will be supporting this action alongside other prochoice organizations in an event in London, soon to be announced. Yesterday, we protested in central London once more against the barbaric antiabortion law proposed by the Spanish government. The action was jointly organized by My Belly is Mine, the Spanish Women’s Assembly and Irish prochoice activists Speaking of I.M.E.L.D.A. and took place beside one of London’s most iconic bridges, Tower Bridge, opposite the Tower of London. Yesterday’s action is the fourth co-organized by Spanish, Irish and British activists as part of an intense summer campaign to protest against the Spanish antiabortion draft bill from London. Previously, we protested during the British Spanish Society’s summer reception at the Spanish Embassy in Belgravia, on the 27th of June -again in front of the Spanish Embassy, and in the London Underground. Our protests will continue until the law is withdrawn. Ayer protestamos de nuevo en pleno centro de Londres contra el anteproyecto de Gallardón. La protesta, realizada conjuntamente por la Asamblea de mujeres del 15M de Londres, las activistas irlandesas Speaking of I.M.E.L.D.A. y My Belly is Mine, se desarrolló al lado de uno de los puentes más emblemáticos de la ciudad, el Puente de la Torre (Tower Bridge), un puente levadizo que cruza el río Támesis y que se sitúa cerca de la Torre de Londres, la que le da su nombre. Esta cuarta acción es la última de una intensa campaña veraniega organizada conjuntamente por activistas españolas, irlandesas y británicas para protestar en contra de la ley Gallardón desde la capital británica. Previamente nos manifestamos ante la embajada española en Londres durante la fiesta de la Asociación hispano-británica, el 27 de junio, y en el metro de Londres. Las protestas continuarán hasta la retirada del anteproyecto. A tiny shred of hope has appeared on the horizon for women and prochoice campaigners battling against the draconian antiabortion bill in Spain. The main force behind the bill, Justice Minister Alberto Ruíz-Gallardón, appears to be increasingly isolated in his determination to pass the bill as law. The bill has suffered a number of unexplained delays in its parliamentary process and is yet to appear on the Cabinet’s agenda. Indeed, at the end of June, the draft bill was ready for its presentation in parliament: reviewed by all the consultational bodies and having gone through its final revisions, the bill’s presentation was initially scheduled for the 27th of June but was postponed for a week. The bill has been postponed a further two times since then. Spanish Justice Minister Alberto Ruíz-Gallardón with the Deputy Prime Minister Soraya Sáenz de Santamaría and Prime Minister Mariano Rajoy. Sources within Gallardón’s own political party, the rightwing Partido Popular, recently claimed that some party members are concerned with the bill’s unpopularity and have pledged to stall it as much as they can. In an attempt to save face, Gallardón was adamant the Ministry of Justice would not allow the draft bill to be shelved. ‘The legislative agenda is not determined by individual departments but rather by the Presidency and Vice-presidency’s office which coordinates all the different ministries.’ stated Gallardón, placing the responsibility for the delays onto Prime Minister Mariano Rajoy and the Deputy Prime Minister Soraya Sáenz de Santamaría. Gallardón neither confirmed nor denied that the law would be discussed at today’s cabinet meeting, although it seems unlikely this will be case. The 1st of August remains the only date to pass the law and as of yet there is no indication the bill is scheduled for discussion that day either. Motherhood is a right, not an obligation. These latest developments are undoubtedly positive ones for women in Spain. Time is running out for the Partido Popular: in order to meet the legislative deadlines in 2014 and thus avoid the Spanish electoral campaign in 2015, this very controversial bill needs to be presented in parliament before September if it is to become law. Prochoice campaigners in Spain and beyond cannot afford to rest on their laurels: on the contrary, they must increase the pressure to ensure the bill is stopped in its tracks in the coming months. On the first of February this year, tens of thousands of people filled the streets of Madrid. They congregated to protest against the regressive antiabortion reform, proposed in December by the Spanish conservative government. Protesters came, not only from all over Spain, but from different parts of the world too. One group of women travelled by train to the Spanish capital from the Asturian city of Gijón, in the North of Spain. These women were responsible for the protest and gave it its name: The Freedom Train (El Tren de la libertad). The Asturian female collectives, Barredos Women for Equality (Mujeres por la Igualdad de Barredos) and The Godmothers‘ Feminist Salon (Tertulia Feminista Les Comadres) were the women who decided one day to charter a train to Atocha station in Madrid. Their aim was to hand in a statement to the Spanish Parliament, asking for the antiabortion draft bill to be withdrawn. The statement was called I decide (Yo decido) and was addressed to the parliamentarians, to the Prime Minister Mariano Rajoy, the Justice Minister Alberto Ruiz-Gallardón, and the Minister for Equality, Ana Mato. Well-wishers wave goodbye to the women travelling to Madrid to protest against the proposed antiabortion legislation. Spanish women travelling down to Madrid on ‘The Freedom Train’. In Madrid, the Godmothers and Barredos Women were accompanied by a multitude of other feminist organisations, politicians, trade unions, supporters and members of the public. They all walked together to the Spanish Parliament, where they handed in their petition. The women head towards the Spanish Parliament to hand in their petition, with the crowd behind them. My Belly is Mine decided to echo the protests in Madrid via a symbolic train 2 Madrid journey. We wanted to show our support to protesters in Spain and raise awareness of the issue in the UK. We boarded a train in London at Charing Cross Station to Waterloo East and we proceeded to tie hangers -one of the symbols of illegal abortion- onto the Southbank’s iconic Hungerford Bridge. Fellow Spanish feminist collective These Hysterical Women also protested in Edinburgh the same day. These Hysterical Women appear in the documentary of the protests which was filmed exclusively by Spanish female filmakers and is now available to watch free and online under the name Yo decido: El Tren de la libertad. “Because it’s my choice, I am free, and I live in a democracy, I demand from the government, any government, that it make laws that promote moral autonomy, preserve freedom of conscience, and guarantee plurality and diversity. My Belly is Mine. I decide! Spain’s controversial antiabortion draft bill will be passed as law this summer, according to the Spanish Justice Minister, Alberto Ruiz-Gallardón. “I’m able to say that the law will be passed before the end of the summer”, Gallardón stated. The draft bill, proposed by Spain’s conservative ruling party -the Partido Popular, was initially scheduled to be debated in parliament on the 27th of June. It was postponed twice and it now seems unlikely it will be debated, as was expected, on the 1st of August. “Summer ends in September”, Gallardón added, implying that the draft bill may be on the agenda of the next cabinet meeting on the 29th of August. However, these delays are good news for prochoice campaigners: the longer the parliamentary process is drawn out, the less probable it is the bill will be approved. 2015 is election year in Spain and the regional leaders and mayors are unwilling to risk their political careers on this unpopular bill. Only yesterday, prior to a meeting at the Ministry of Health, government representatives from Asturias, Andalusia, the Basque Country, the Canary Islands and Catalonia renewed demands for the bill’s withdrawal. My Belly is Mine believes prochoice groups must keep up the pressure to ensure the bill is postponed for as long as possible. Indeed, despite confident press statements, Gallardón’s (almost obsessive) determination in passing one of the most restrictive laws of Spain’s democracy is leaving him increasingly isolated. Prochoice people: Keep up the fight! Mireia and Cristina, two of My Belly is Mine campaigners, met with Jim Jepps from the North London Star. Jim wanted to find out more about the campaign and the political activism of young Spanish migrants in the British capital. You can read the article here. The already delayed parliamentary process of Gallardón’s antiabortion bill may be halted once more, according to Spanish government sources. The bill, scheduled to enter parliament on 27th of June, was delayed until the 4th of July to coincide with the antichoice conference in Madrid. Feminist organizations protested on both dates and the intervening week in Spain and abroad. 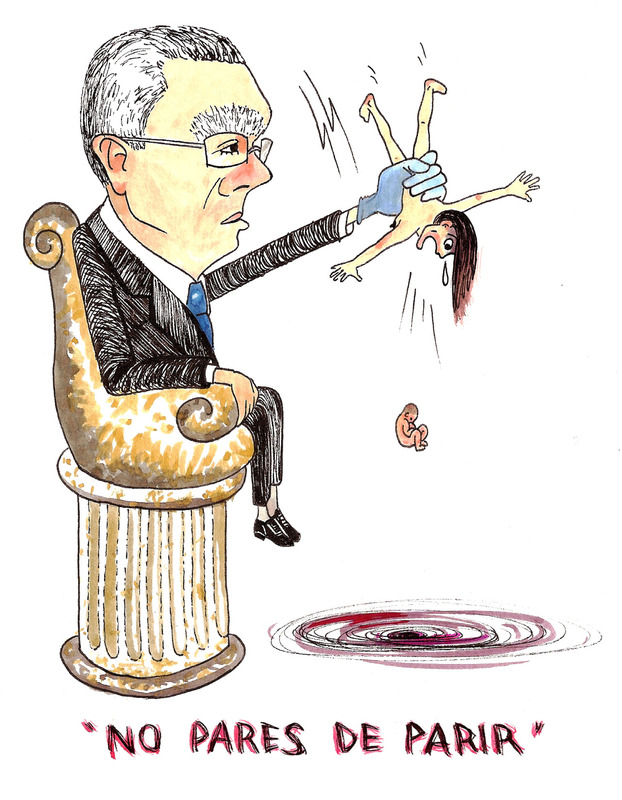 Gallardón’s unexpected absence from the antichoice conference prompted the government to confirm the draft bill is still awaiting official reports from various consultative bodies. Furthermore, once these reports have been completed, the draft bill will then be sent to the Spanish Council of State, the supreme consultative body of the Spanish government, which only advises parliament on the most serious matters and legislation. This means that the bill’s parliamentary process could be extended for months due to the complex procedure the Council adheres to. Spanish feminist and prochoice organisations have cautiously welcomed this news. As Justa Montero, spokesperson for Madrid Feminist Assembly explains: “If the bill has not entered parliament within six months, the deadline will have passed and they must wait for another legislative period to begin…and then we shall see.” Montero hopefully added that “in 2009 the Council of State unanimously approved the report recommending the 2010 abortion law“. The Ministry of Justice, on the other hand, has stated that the Council of State’s report may not be absolutely necessary for the draft bill to be debated in parliament, thus speeding up once more its legislative progress. This news leaves prochoice campaigners on tenterhooks, as it is no guarantee that the draft bill will not eventually be passed. Just another selection of the lovely people who are attending the antichoice conference in Madrid today. 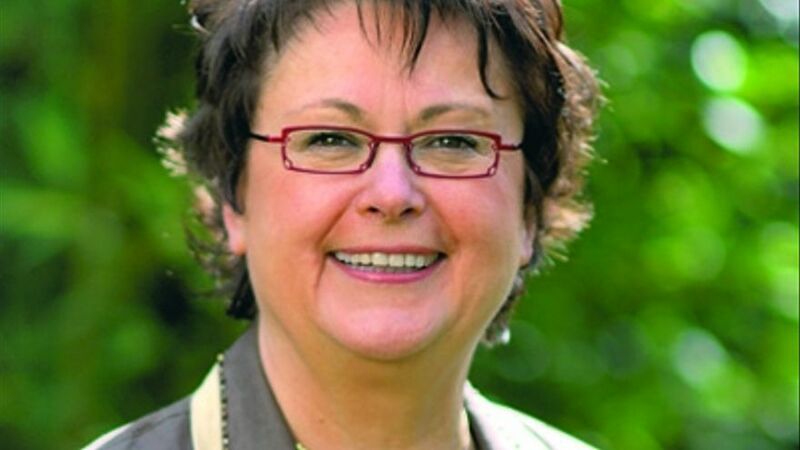 There will be a nice official reception hosted by the mayoress of Madrid, Ana Botella, later on in the day. Such fun. This French ex-MP, who claims Spain is spearheading progress with its antiabortion law, stated on one point ” We are being overrun with gays“. 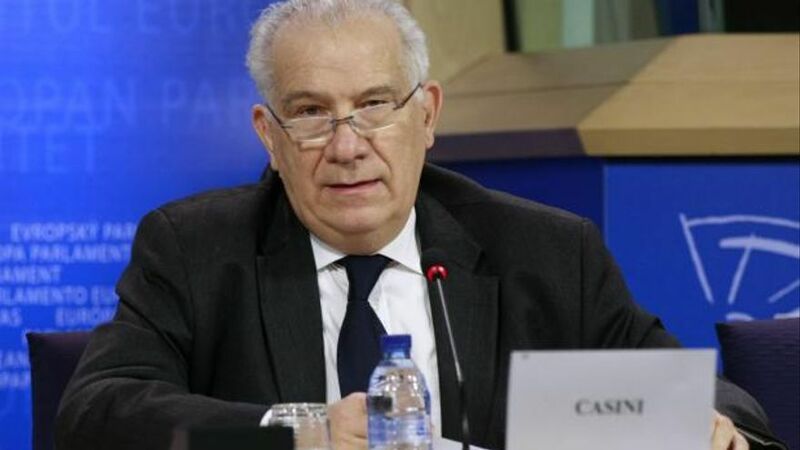 Head of the Italian antichoice movement, Carlo Casini, a MEP, declared: “Both child and mother are victims of abortion”. 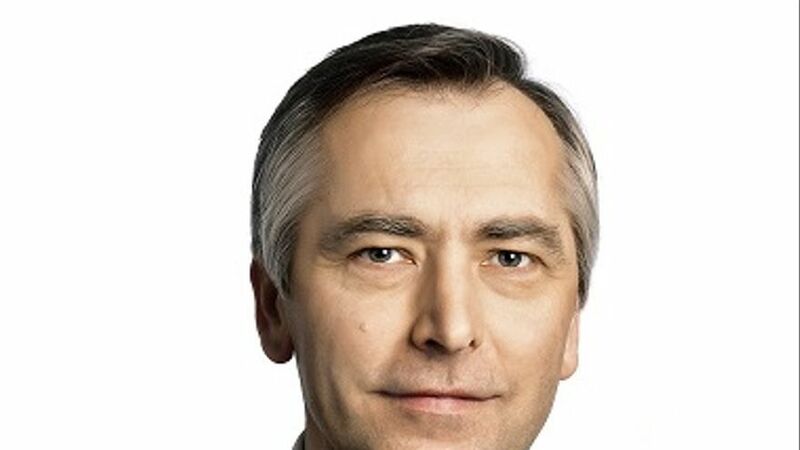 Jan Figel, vice-president of the Slovakian parliament, halted the gay marriage bill in his country. Although gay marriage finally became legal this year, Figel is adamant that marriage should be between a man and a woman. 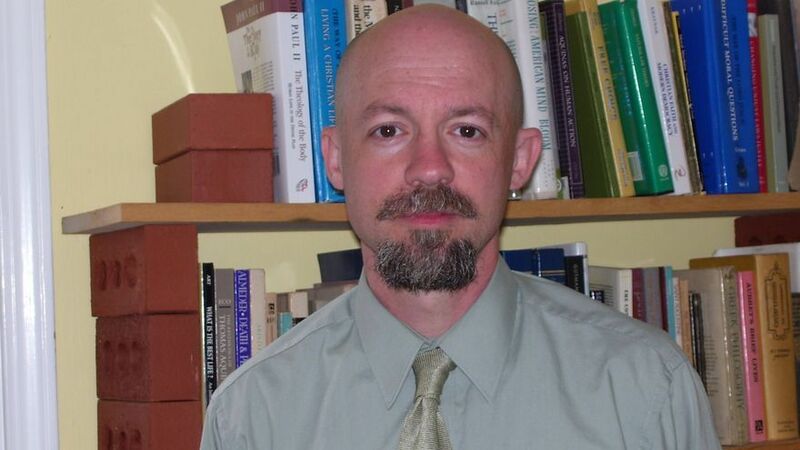 Tollefsen is professor of philosophy at the University of South Carolina and co-author of Embryo: A Defense of Human Life. According to El Diario, he is quoted as saying: “I think it’s normal for a prolifer (sic) opposed to abortion to become a prolifer (sic) who advocates chastity in and out of marriage”. Figure that one out.